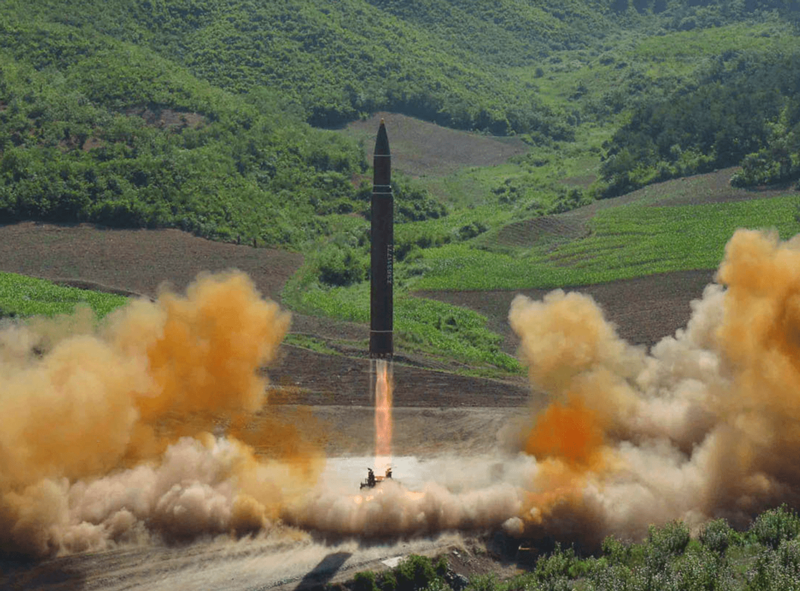 The Hwasong-14 (U.S. designation KN-20) is a North Korean intercontinental ballistic missile (ICBM), first tested on July 4, 2017. It is the first ICBM North Korea has flown. The missile has an estimated range in excess of 10,000 km, making it capable of reaching most of the continental United States. Hwasong-14 launch, July 4, 2017. Based on its July 28 performance, the Hwasong-14 could have a range of over 10,000 km if flown on a range-maximizing ballistic trajectory. This is far enough to reach the majority of the continental United States. If factoring in the rotation of the Earth, which provides a range boost when travelling eastward, the Hwasong-14’s coverage area would include the West Coast, Chicago, and possibly even New York. The Hwasong-14 is likely a two-staged version of the single-stage Hwasong-12 intermediate-range ballistic missile (IRBM), which North Korea first tested in May 2017 to a range of around 4,500 kilometers. July 4, 2017 1 Flight time: 39 min; distance traveled: 930 km; apogee: 2,803 km. July 28, 2017 1 Flight time: 47 min; distance traveled: 1,000 km; apogee: 3,700 km. The missile’s first stage engine appears similar, if not identical, to the Hwasong-12. A single liquid-fueled engine, it is accompanied by four Vernier thrusters for stability and guidance. North Korea conducted at least two suspected ground tests of this engine in March and June of 2017.6 This newer engine design appears to be distinct from the KN-08 and KN-14 ICBMs, which North Korea displayed but never flight tested. The KN-08 and KN-14 are believed to use 4D10 engines reverse-engineered from imported Russian SS-N-6 submarine-launch ballistic missiles. As such, it is probable that the Hwasong-14 is largely unrelated to the KN-08 and KN-14 designs. Less is known about the Hwasong-14’s second stage, but imagery from the July 4 launch shows what could be retrograde rockets on the first and second stages.7 Retrograde rockets are used to decelerate a missile stage during separation to ensure the multiple stages do not collide, and are considered an essential element of multistage rocket design. It is worth noting that in 2013, experts pointed to the KN-08’s lack of retrograde rockets as evidence that the KN-08 was a mock-up.8 The inclusion of retrograde rockets on the Hwasong-14, consequently, shows the significant progress North Korea has made in ICBM technology in a short period. Debate continues over the Hwasong-14’s reentry vehicle and whether it is capable of surviving the stresses associated with ICBM distance. 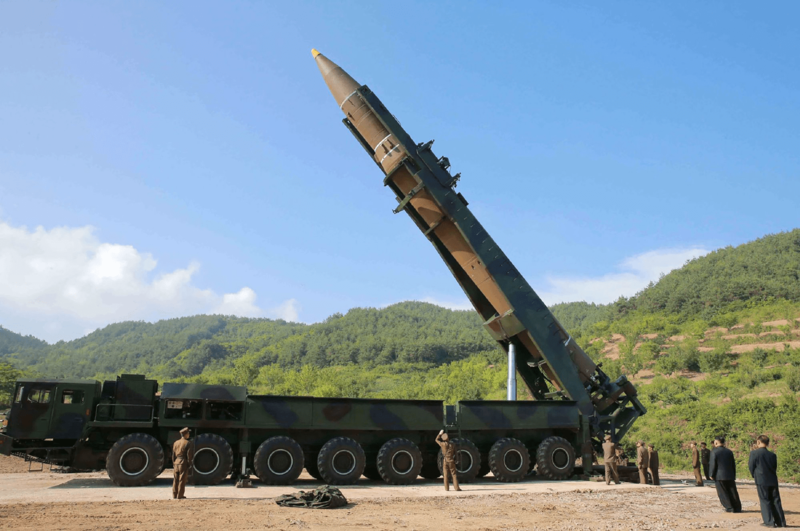 Like the Hwasong-12, the Hwasong-14 appears to be transported on a transporter-erector vehicle, but launched from a detachable platform on a concrete pad. This could have several operational ramifications. It may increase the time required to launch the Hwasong-12, and limit the number of launch locations to pre-sited and pre-constructed launch pads. It is presently uncertain whether the Hwasong-14 configuration tested on July 4, 2017 is meant for production and deployment. It is perhaps more probable that this missile represents a technology demonstrator that will undergo additional testing and upgrades to further increase its range before the missile goes into serial production. Such upgrades may include the addition of a third stage. Missile Defense Project, "Hwasong-14 (KN-20)," Missile Threat, Center for Strategic and International Studies, July 27, 2017, last modified June 15, 2018, https://missilethreat.csis.org/missile/hwasong-14/. “DPRK Succeeds in Test-launch of Inter-continental Ballistic Rocket,” Korean Central News Agency, July 4, 2017, https://kcnawatch.co/newstream/1499256174-149984450/dprk-succeeds-in-test-launch-of-inter-continental-ballistic-rocket/. “Seoul confirms N. Korean ICBM test, sees ‘high’ possibility of nuke test,” Yonhap, July 5, 2017, http://english.yonhapnews.co.kr/national/2017/07/05/0301000000AEN20170705003554315.html. John Schilling, “North Korea Finally Tests an ICBM,” 38 North, July 5, 2017. Ankit Panda, “Why Is Russia Denying That North Korea Launched an ICBM?,” The Diplomat, July 11, 2017, http://thediplomat.com/2017/07/why-is-russia-denying-that-north-korea-launched-an-icbm/. Ankit Panda, “New Details on North Korea’s Second ICBM Test Suggest Improvements, Further Testing Ahead,” The Diplomat, August 3, 2017, http://thediplomat.com/2017/08/new-details-on-north-koreas-second-icbm-test-suggest-improvements-further-testing-ahead/. Aria Bendix, “North Korea Tests Another Rocket Engine,” The Atlantic, June 23, 2017, https://www.theatlantic.com/news/archive/2017/06/north-korea-tests-another-rocket-engine/531390/. Tal Inbar, Twitter Post, July 4, 2017, https://twitter.com/inbarspace/status/882174666860892163. Hunter Stuart, “North Korean Missiles Are Likely Fake,” Experts Say: Report,” Huffington Post, August 15, 2013, http://www.huffingtonpost.com/2013/08/15/north-korea-missiles-fake-report_n_3761325.html.